The national March For Our Lives event aims to capitalize on the student momentum encouraging actions against gun violence. As the students have made perfectly clear, your elected representatives do not appear likely to act against gun violence. They've taken meager and meaningless, perhaps dangerous, steps to arm teachers or maybe look at mental-health issues—but not really. Since Sandy Hook five years ago, there have been 1,576 mass shootings resulting in at least 1,788 dead and 6,333 injured. An Assault Weapons Ban in 2013 went nowhere in Congress. 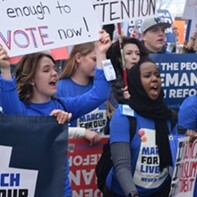 Consequently, students, parents—people—will be taking to the streets in the national March for Our Lives events. Ultimately, the ballot box is the place to make change. West High School, 241 N. 300 West, 385-722-4138 (text only), Saturday, March 24, 11 a.m.-1 p.m., bit.ly/2Ig0FZF. Park City, 10 a.m.-noon, Saturday, March 24, bit.ly/2FUJOKk. Join Moroni Benally, co-founder of the Utah League of Native American Voters, as he examines the marginalization of Native Americans in our society. "By applying a pre-determined filter about what it means to be indigenous, modern society caricatures the reality of Native American concerns," says the community organization Books & Bridges. Benally will speak about the Navajo culture in Indigenous Erasure and the Navajo Kinship System, after which there will be a Q&A session. Weller Book Works, 607 Trolley Square,801-328-2586, Thursday, March 29, 6:30-8 p.m., free, bit.ly/2HCzpmS. The Utah Legislature is done—at least until an interim session—but don't breathe a sigh of relief yet. The governor has 60 days to approve or veto the hundreds of bills that passed. To find out more, what has happened and what you still can do, attend one of the many Legislative Wrap-ups this year. There's one from Utah Cultural Alliance that will talk about the impacts on arts, humanities and cultural businesses. And the League of Women Voters will wrap up its legislative year talking about everything from redistricting to SLC's Northwest Quadrant. UCA: Zephyr Room at Rio Grande, 300 S. Rio Grande St., 801-652-0737, Friday, March 23, 1-2 p.m.,$7.33/nonmembers, $4.69/members, bit.ly/2FEcYkJ. LWV: Girl Scouts of Utah Headquarters, 445 E. 4500 South, Ste. 125, Murray,801-272-8683, Thursday, March 22, 6-8 p.m., free, bit.ly/2pgeZZg. A questionably timed op-ed. Utah and UTA's trusting nature. Plus, get ready for more ballot initiatives.